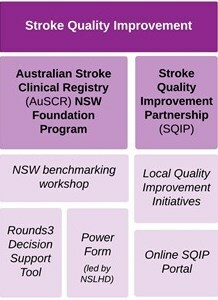 Working to improve the experience and delivery of healthcare for NSW stroke patients by better co-ordinating stroke services and providing a forum to share resources and promote expertise. The Stroke Foundation recommends the F.A.S.T. test as an easy way to remember the most common signs of stroke. More Information on Stroke as An Emergency. Face - Check the person’s face. Has their mouth drooped? Arms - Can the person lift both arms? Speech - Is the person’s speech slurred? Do they understand you? A stroke is always a medical emergency. The longer a stroke remains untreated, the greater the chance of stroke related brain damage. Emergency medical treatment soon after symptoms begin improves the chance of survival and successful rehabilitation. Develop ECR Referral Criteria Guide to ensure all clinically appropriate patients in NSW have timely access to neurointerventional services when required. To undertake a State Stroke Reperfusion Program Economic Evaluation in collaboration with the ACI Health Economics and Evaluations Team. Collaboration with the ACI Rehabilitation Network to implement and share evidence based quality improvement projects in stroke care. Collaborative education sessions with ACI Cardiac and Endocrine Networks for rural, remote and regional clinicians on diabetes, cardiac and stroke ( DICAST ) issues, including sessions for rural general practitioners with specialists. Establishment of 35 stroke services (acute stroke units and stroke services) in NSW public hospitals since 2003. Audits of more than 5,000 cases have demonstrated improvement in patient outcomes resulting from the specialist stroke units. 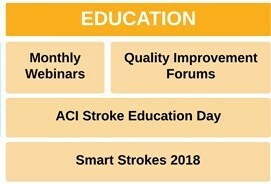 Rural education workshops to increase awareness of stroke issues among allied health, ambulance and nursing staff from rural inpatient, outpatient and community services. Rural education evenings for general practitioners and hospital medical staff. 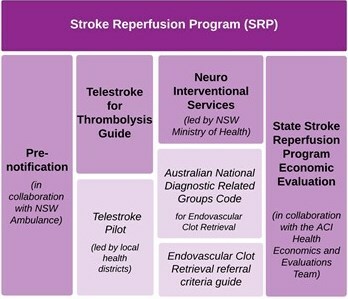 Participation in the Australian Stroke Coalition’s workforce, training and professional development, response to acute events and access to stroke units and rehabilitation working parties.